Never Get Stuck in a Coaching Session Again! When we think of stress we usually think of the "Fight" or "Flight" response, but "Freeze" is just as common. And in my early days of coaching I used to freeze quite a bit - where I got stuck in a coaching session and couldn't think what to ask next. I was so concerned about delivering value and being a great coach that I often created the very situation I feared most. And then I would make the situation worse by judging myself and beat myself up for my 'failure' to stay on top of the session. If it makes you feel any better, I can guarantee that that moment of panic - when you have no idea what to ask or which direction to head in - has happened to every single coach out there. In fact it's probably happening to someone right now. So I developed a strategy to get me through those moments when I froze. If the whole point of coaching is that the client knows what's right for them, why was I trying so hard? If they have the answers, doesn't it make sense they might know some of the questions too? The strategy? Get the CLIENT to tell you what to ask next! Watch out for: It's easy to make the situation worse when we freeze by judging ourselves and letting our inner critic beat us up for our 'failure' to stay on top of the session. This only creates a vicious circle where we take ourselves even further away from dancing in the moment with our client! The Trick: Is to take a deep breath and ask a question which asks the client to show you the next steps. This is about trusting the coaching process - and trusting your client to know what's best for them! The simplest and also the most challenging strategy is ironically... more silence. Simply wait for your client to speak again. Take a deep breath, feel your feet on the floor and trust that your client knows what to say next. It takes a lot of guts when you're already panicking to give the client more silence. It means sitting with and allowing the discomfort of NOT knowing. But if you lean in to the silence and your discomfort, real coaching magic can happen. And it may not happen too! If after this extended pause your client pipes up and says, "Are you still there?" (which has happened to me on more than one occasion) you can simply say, "I was waiting to see where you would take this next." Then, like me you'll quickly learn that your client didn't think you were a terrible coach. And you'll learn that the world does not end simply because you don't have the all the answers - or indeed the right questions. And once you've had a few of these experiences you'll realise you can handle anything. What a beautiful place to be! 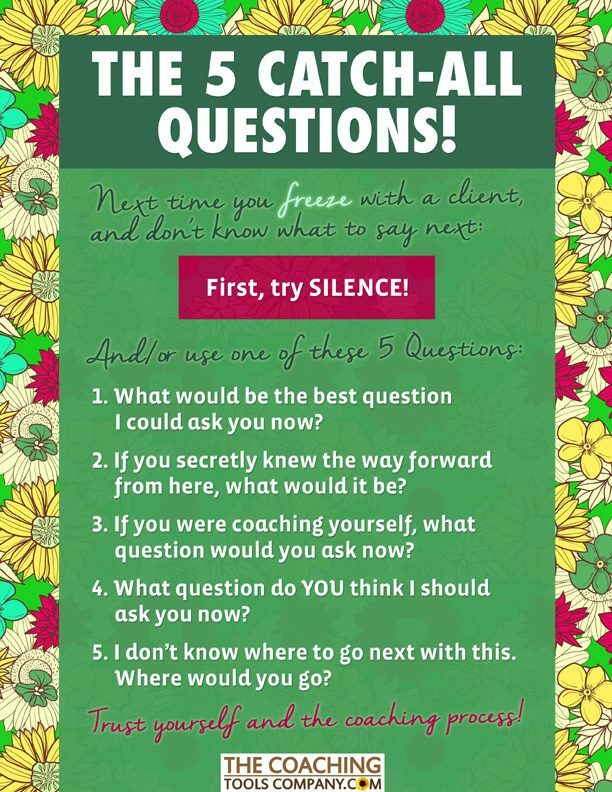 I recommend that you take the 5 questions above and write or print them out on a piece of card, add the word SILENCE to the top, and stick it somewhere you can easily see when you're coaching a client. Click to save the .PDF version to your computer! If I've done my job well, you're now feeling inspired and keen for that next moment when you freeze - so that you can try these strategies out! Have any tips of your own for this situation? Share with your fellow coaches by commenting below. The 5 Simplest Coaching Questions to Brainstorm Actions and Move Your Clients Forwards! Use This Questioning Process to Help Your Clients Spot Where They are Blocking Themselves! Good questions. I have used question 3, If you were coaching yourself...Not only does it buy me time, but it also educates my coachees. It helps them think from a coaching point of view. One of the things I try to do is to give my coachees some tools they can use to grow as a leader. Thanks for sharing. Thanks Travis! I really am loving this blogging/sharing! And very true - it's great to get people into that coaching point of view - in fact that's a skill that if we help our clients develop they won't need us (so much) anymore... Which ultimately is a good thing! Hi, I am a new Christian Life Coach and I don't have any clients yet. I have tried online and print advertising and marketing and still nothing yet. Someone suggested that I offer my "Fans" on my Company's Facebook Page - a chance to experience Life Coaching as a Group. In other words, to offer some Life Coaching Sessions in a Group. This can be done over the phone using one of those free Teleconferencing sites, etc. My question is - how do I even go about Coaching in a Group setting? I am a Certified Life Breakthrough Coach so I have some training but my training was geared to coaching privately - with clients on a one-to-one basis - so how do I now take what I already learned and coach a Group of people? Any ideas or suggestions or free Resources out there to help me Create or Plan a Program for my Group Coaching Sessions? I'd appreciate anything you might have to offer me. Thanks so much for your time and God Bless! Jennifer Britton (whose articles we feature occasionally) has a couple of books on Group Coaching. Here are the 3 articles she has written for us so far: https://www.thecoachingtoolscompany.com/tag/jennifer-britton/ Jennifer also has reasonably priced training programs for Group Coaching. Also, have you thought about working with a business coach to help you get your business off the ground? Plus, it can be really helpful to meet up with other coaches, get inspired and get support. What works really well for me is my list. I own a website and people can sign up for a free course. They will receive a weekly quality newsletter. Once a month I offer 10 free sessions and through this concept I get my clients. I never advertise, but write quality articles and provide a great newsletter, that offers a lot of tools and wisdom people appreciate. It takes more time, you will need a year or so to build it up from zero. But it's well worth it. Thank you, Emma, for a very helpful post! I will definitely try these questions out. Although it's not happened in reality as I am in training right now, I tried one of these questions while practicing the mock session and the person replied, "Well, I don't know, that's why I am here!". I experienced the embarrassment. How can we deal with such scenarios? Thank you. Dear Tripti, thank-you for your comment - and glad you like the post! So, I am guessing you used "If you secretly knew the way forward from here, what would it be?" If so, this is a question to use carefully - and as it says - only with good rapport. It's therefore not a great question to use in an initial session - as it's unlikely you'll have built a great rapport yet. In other words, once they have got used to you coaching them, challenging them, asking them odd questions and turning the question back to them (as they have the answers not us! ), that is a better time to ask this question. And then they still might say, "That's what I've come to you for!" "Often people know what they need to do on some level, but it's difficult, scary or challenging, so instead they do nothing. Do you know what you WANT - even if you don't know how to get there?" "Well, I am glad you are here, and we will work on this together. What do you know about this situation right now?" "Often we say we don't know, but a part of us DOES know. Is there a part of you that knows something?" "OK, so let's start by getting really clear on what you WANT. Could you describe where you want to be (in as much detail as possible)?" I hope that has given you some ideas! Be proud that you tried something new!